You all were so amazing with the hair tips yesterday that I HAD TO DO IT. I stopped at the store on the way home and found a color … in 2 different brands. A frantic tweet for help went unanswered* so I spent the better part of an hour pacing, trying to figure out which one. Finally I decided to go with the slightly more expensive (and let’s be honest … cooler looking box) brand. I picked a color I deemed to be safe (less red than I was planning on … just in case it all went horribly wrong) and went home. The box promised me the process would take 10 minutes, the formula would be no drip, and the results would be shiny and wonderful. Well … one out of three isn’t TOO bad. The process, all told, took about 30 minutes. 5 for mixing of the color, another 5 for the fighting of the towel that was SUPPOSEDLY draped gracefully around my shoulders, and 20 for fighting all my masses of hair. Masses of hair that were decidedly rebellious. 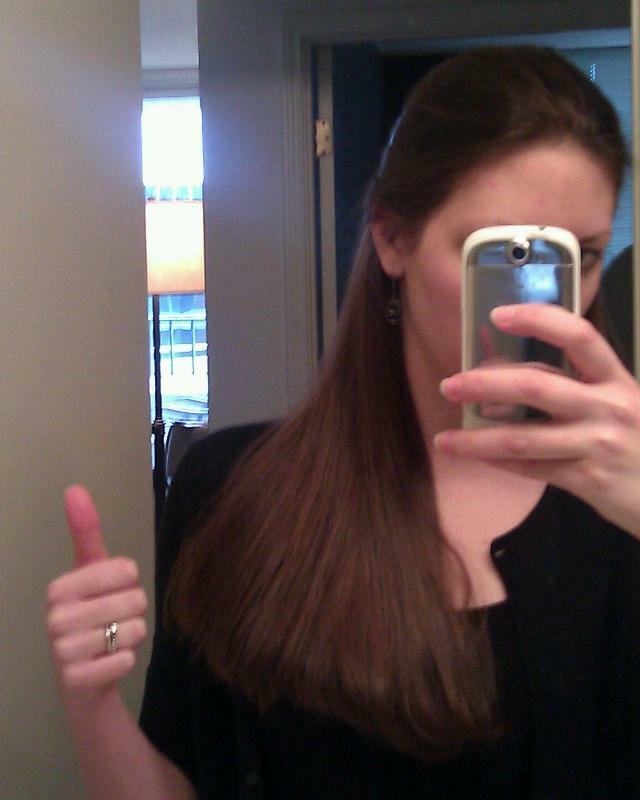 One quick note … everyone online said one box should only be enough for shoulder length hair. My hair is currently down to my bra clasp, in the back. I used about 2/3 of a box. My hair is super thin, maybe that’s why? As for the drip part … well, let’s just say my husband was sitting on the floor at midnight, trying to cut a drip from the light bathroom rug. Clearly, I won’t forget to remove that again. Oh well, the thing needed to be washed anyway. Which is why the alternate title to this post could be “How to Dye Your Hair for Yourself and No One Else”. 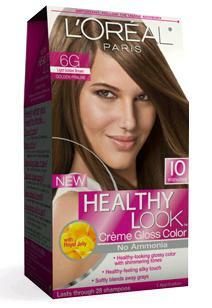 A quick review on the L’Oreal Healthy Look: this product rocked. Yes, it was drippy, but it wiped off my skin cleanly without any trouble. I even forgot to put the gloves back on when I went to rinse everything out, and even my nails are still clean. And this was some DARK dye. The shower, countertops, and sink cleaned up with minimal effort. Fabric was another story all together. A lot of reviews say it made their hair feel like straw, but mine came out (after using the included conditioner) silky and easy to brush. Speaking of the conditioner though … I wouldn’t use it again. It has a pretty strong smell that I’m just not in love with. It’s not BAD, but not really to my liking. Ohh very pretty. You can see the difference in the side by side pictures, and while subtle it is nice. Sometimes it doesn’t take much. Most importantly you like it, which is really all that matters. Good job! And yes, subtle. People won’t notice if I didn’t say anything, which works for me. This one was a “Light Golden Brown” but I think next time I’ll to a Chestnut Brown. Slightly more red. Just in time for winter. YAY! Its ok, I’ll try it out this weekend and let you know how it goes! I’m going to try and get a really loose wavy perm while I still have all this hair – seemed foolish to chop it all off right before winter, but what do I know. Also, I have never managed to dye my hair at home, in probably about 30 tries, with fewer than two packages. So I am impressed. 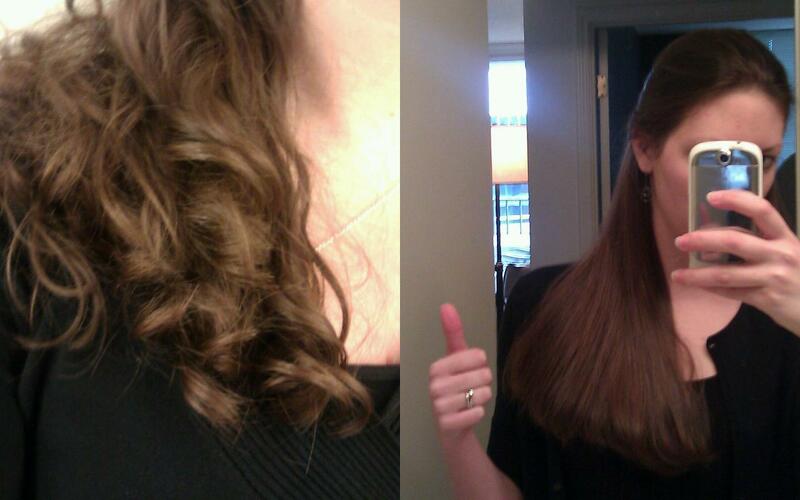 I may have used too little, but judging by how it turned out, I think it’s just that I have such fine hair. 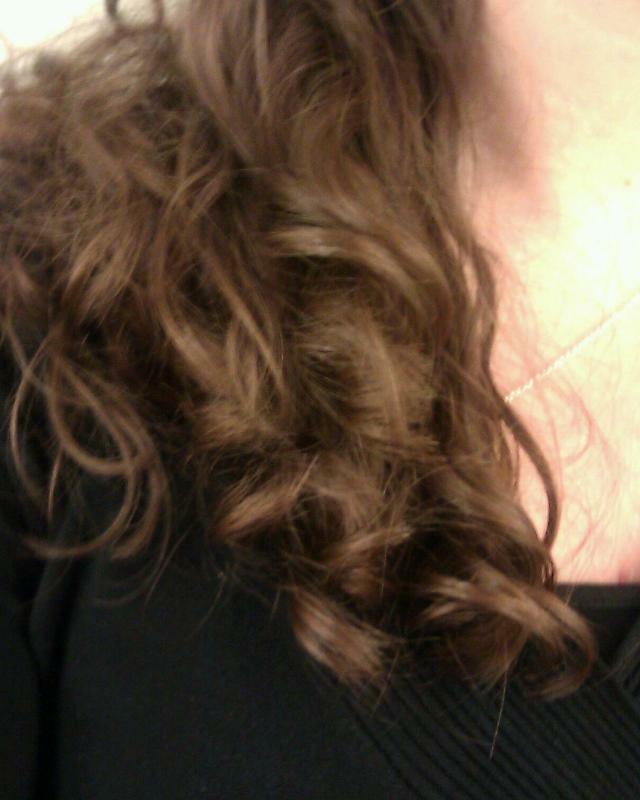 The curly (and the length!) is deceiving! I do think this whole process would have been easier if someone was there to help. Probably would have taken a LOT less time! It looks really nice and I think it’s a decent amount of change! Definitely noticeable. Love the red you chose, it looks very natural on you. I remember your curlers fondly, by the way. Can’t do my hair up in curlers without thinking of you! Aw! When I think of that I think of the time I almost killed your head for homecoming hair. It was so pretty, though! That, btw, is natural. Humidity, go figure. It looks wonderful! I always went for the coppery “I’m a leprechaun” reds because I’m the only one in my family who doesn’t naturally have that color, so I’ve done my fair share of at-home dye jobs! If you find a stubborn spot on your skin or on countertops, tubs, whatever, try some astringent or nail polish remover. It will clean that spot right off! Thanks for the tip! I’ve got one spot that won’t come up for the life of me … I’ll try that tonight! Pretty lady! I like it. Oooo!!! I REALLY REALLY like it!! It looks awesome sauce and perfect for the fall. 🙂 YAY! Thanks! I like it a lot, though it’s already starting to fade … probably from the fact that I didn’t use a red dye, I used a brown one. I think I’ll do it again (maybe just before my birthday?) and use an actual red dye this time and see how it turns out!